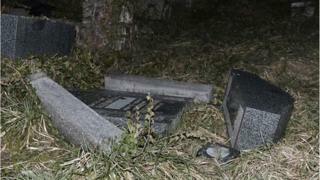 Hundreds of Jewish graves have been desecrated at a cemetery in eastern France, near the border with Germany. Images on social media showed the gravestones in Sarre-Union daubed with swastikas and Nazi slogans. On his Twitter feed, Prime Minister Manuel Valls said every effort would be made to catch the perpetrators of an "ignoble and anti-Semitic act, an insult to memory". Anti-Semitic attacks have risen sharply in France in recent years. A kosher supermarket in Paris was one of the sites targeted by Islamist gunmen in a series of attacks last month which left 17 people dead. A special investigative team is at the cemetery in Sarre-Union, the French news agency AFP reports, quoting Interior Minister Bernard Cazeneuve.